Peacock Lane is a collection of 24 prints divided into two colorways (Cherry Chip - browns and pinks - and Rainbow Sorbet - blues, yellows and greens - that mix together beautifully. 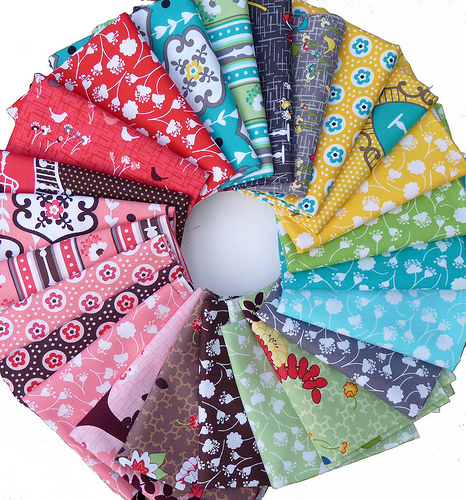 I was really drawn to this collection with it's wonderful bright colors and simple designs and couldn't resist purchasing the full collection in Fat Quarters. This bundle of fabric has proven to be great eye candy and I have moved it around my sewing area several times just to get a glimpse of it as I am working away. Now awaiting the arrival of inspiration for what this bundle is to become. I've not seen this fabric before and it's beautiful. I love the solid full colors that are used and the two colorways do look really nice together. very yummy...fresh and fun. I look forward to seeing your creations Rita. Love the colors, all fresh, fun, and cheery, except for the gray that is. Gray is not my thing. Sorry. I don't think I've met a Michael Miller I didn't like. Can't wait to see what you make from it. Love that fabrics,are just beautiful. Wow...love this! Thanks for sharing!!! Lovely set of fabrics. Have fun sewing them! Oh my goodness! 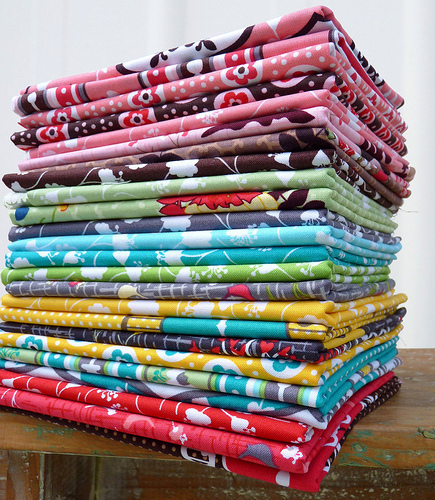 I can not express how excited I am to see my fabric collection on your blog. I adore your work and I can not wait to see what you do with it! Thank you, thank you, thank you, Rita!! !